Hello there, today I have a card to share that I made for my mum to say thank you for the Christmas presents she gave me. The card started life following THIS sketch but then deviated slightly. That often happens to me when following sketches! I was also inspired by the amazing Laurie Willison to add some embossed lines to my card base. I started off by taking an A2 white card base and embossed lines on to it using a bone folder and score board. I scored the lines every half an inch but left an inch gap for the sentiment. The sentiment, from the MFT Thanks So Very Much set, was stamped using black ink. 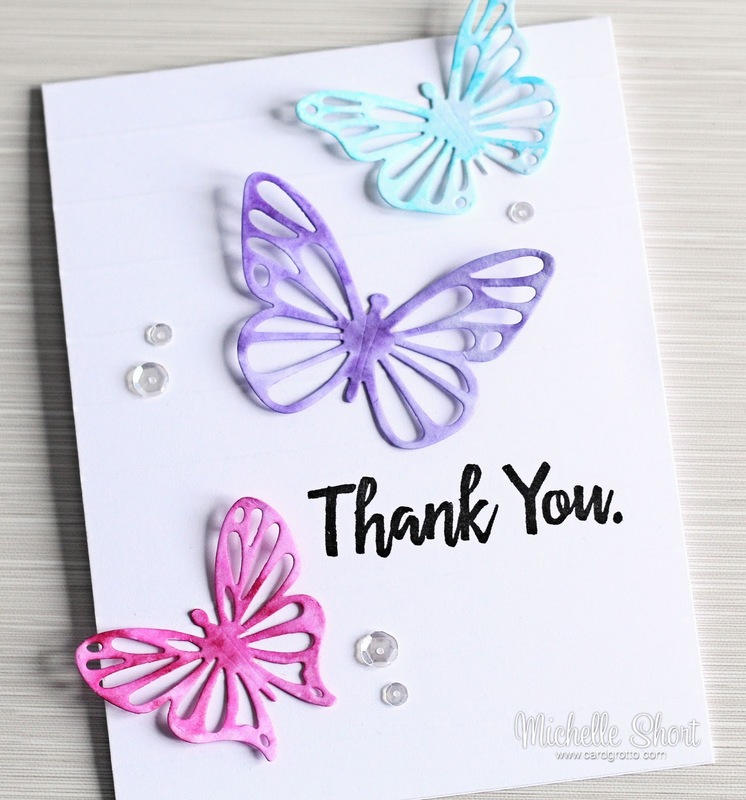 I then took the MFT Flutter of Butterflies Lace dies and cut three of these from watercolour cardstock. I then painted these using Peerless Watercolours. Once dried, I spritzed them with a mixture of water and Perfect Pearls using a mini mister bottle. Once dried for the second time, I added these to the card base with some liquid glue in the centres. To finish the card off, I added some Pretty Pink Posh Sparking Clear sequins. PEERLESS WATERCOLOURS: Jackqueminot Red, Rose Red, Mauve, Amethyst, Peacock Blue, Forget Me Not. I have to say, I am loving using these Peerless Watercolours and hope to have a video using them soon. Thanks so much for visiting me today. Have a great day! Gorgeous card, Michelle! Those butterflies are so beautiful and I love the lines in the background too!!! My word, what a elegant clean and crisp card, simply stunning and love the pretty butterflies. I too love Laurie Willison work and the simple embossed lines effect, think it's beautiful technique. Gorgoeus. I love the butterflies. beautiful card Michelle simple but stunning. 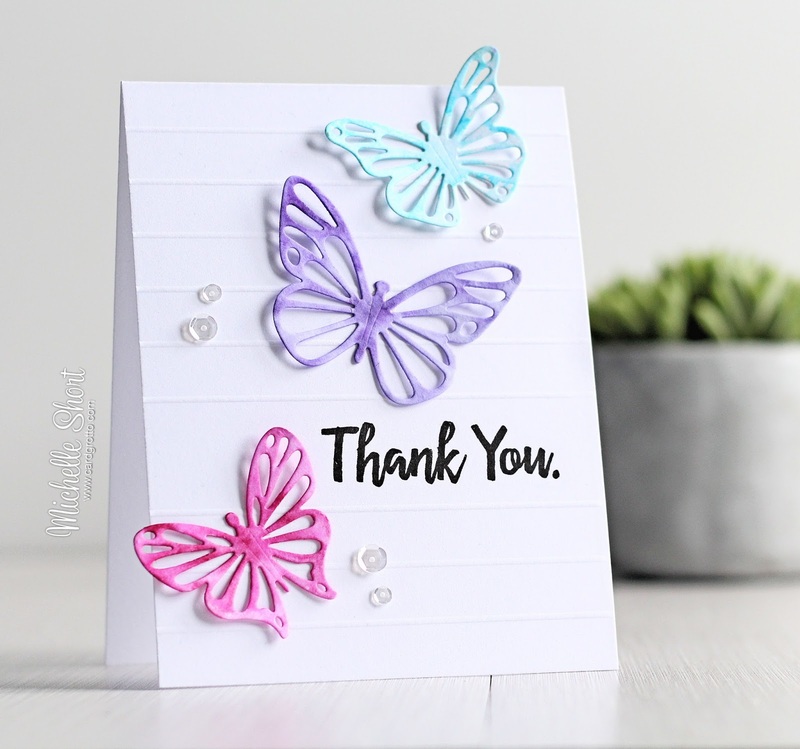 Beautiful cards...love your sweet trio of butterflies. 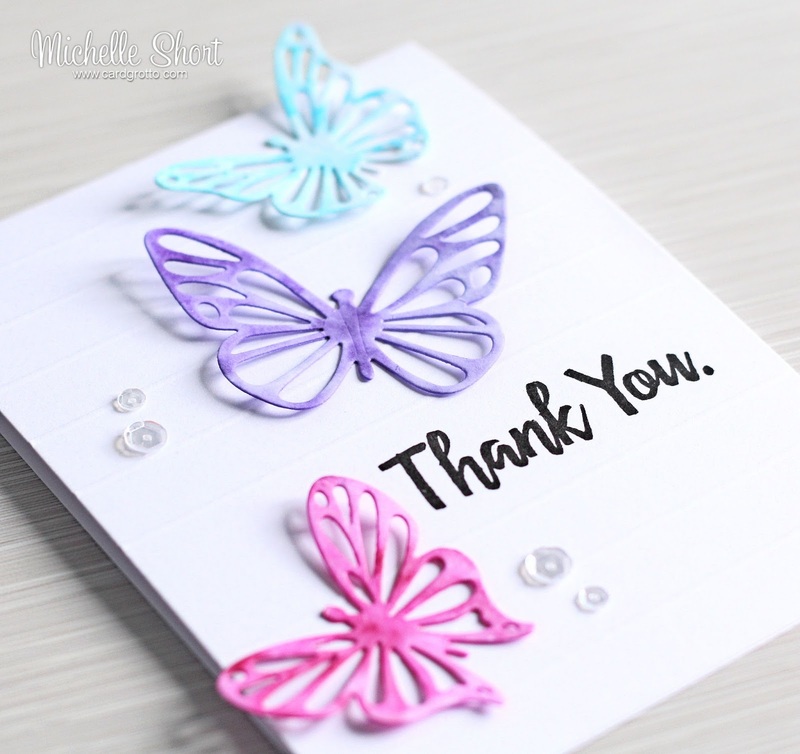 Hi Michelle - great card - do you ever get hit with import charges and taxes when ordering from US based companies such as Ellen Hutson, SSS, and Pretty Pink Posh? Many thanks. Hi Michelle - brill card. Quick Q - do you ever get hit with import charges and taxes when ordering from US based companies such as Ellen Hutson, SSS, and Pretty Pink Posh? Hi Apela, thank you. Yes, unfortunately anything you purchase over £15 is subject to customs charges unfortunately. Usually VAT is not too bad but you have to add on an £8 Royal Mail fee as well which is pretty rubbish! Please feel free to email me for more info. Thanks loads for replying. What a pain though. Shame everything isn't so easily available in the UK. Many thanks.